7 Kids and Us: Daddy Scrubs Shirt Review and Giveaway! What Dad doesn't like a cool trendy shirt? 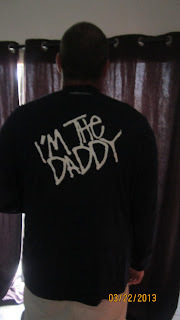 At Daddyscrubs.com I was able to pick out a long sleeve tee which I got in navy saying "I'M THE DADDY!". The front of the shirt it also reads "Daddy" where you would possibly have a pocket. I gave the shirt to my husband as a gift. He has worn it a lot now and really likes it. 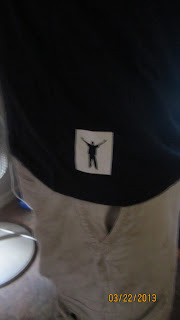 I like how well it washes but then I have reviewed a bunch from Daddyscrubs.com and their products are great! The shirt is 100% cotton and can come in black or navy. "I'm The Daddy" long sleeve tee is only $29.95! It does not shrink or lose color with washing. Look at some of the other items I had a opportunity to review from Daddyscrubs. Enter to win a I'M THE DADDY long sleeve tee, enter the rafflecopter below. Open to U.S. residents only, contest ends 4-9-13. Would love this for a neighbor friend! I am sure my fiance will love this!!! My fiance :) we are trying at the moment! Brother in Law who is expecting his first baby with his wife. My husband. He is a dad and grandpa. I will be giving this to my brother-in-law if I win this because they are expecting their first baby in JUNE! my husband would be the lucky one! The man who married my niece will be getting this. They are expecting for the first time, and it's twins! She's having several showers, but this would be a gift to make him feel special. My husband will be receiving the shirt.